The complete well-being of our patients is our mission: nothing less will do. We get professional satisfaction from providing the very best dental treatments – and also from receiving compliments from our patients! We provide a caring service with a personal touch, which gives our patients peace of mind, and reduces their stress and anxiety. We cover all major dental treatments which include – tooth surgery, gum surgery, root canal treatment, crowns and bridges, dental implants, dentures, teeth whitening services, fillings, scaling and polishing. Our services include aesthetic dentistry as well as oral surgery. And of course, we handle emergency cases, wherever there is trauma or pain. This is also known as cosmetic surgery, in which our treatments amend the look of a patient’s teeth and gums. Services such as dental implants, braces, crowns and bridges, veneers, teeth whitening and dentures are all accessible to our patients. Our dentists are trained to carry out different types of oral surgery – including wisdom teeth extractions, root canal treatments, bone grafting and sinus lifts. For more information about oral surgeries, kindly take a look at our dental videos. Our specialists treat children of all age groups. They are also friendly and caring in their approach, so as to reduce anxiety whenever possible. We will always give you the most applicable advice for your situation. We can detect a number of conditions at an early stage, which include teeth grinding and gum disease, to avoid a more serious problem developing. 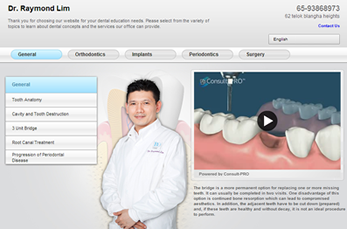 Singaporean residents can avail of Medisave for certain treatments like wisdom teeth extractions. All our dental centres are uniquely designed to be modern, comfortable and relaxing spaces. We have included user-friendly features such as TV screens for our patients to watch during their treatment. Strict hygiene control is something we insist on, and only the highest-quality materials and equipment will do. Read more about our dental centres, and plan your visit accordingly. We’ll be more than happy to show you any of our equipment, and explain exactly what it does.